Find hotel near Thomas River Historical V ..
Set in an era from the past, the Thomas River Historical Village takes you back in time. Located in Cathcart, this village has recently been restored to its original glory. Here, you can observe how the village used to function in the 1800s. 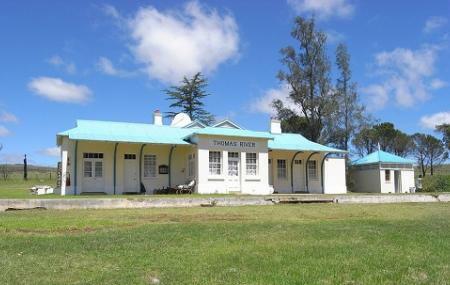 Old train stations, forts and structures are definitely worth a visit. The village is named after Thomas Bently, a British deserter who was killed by a poisonous arrow. While here, dont miss out on the Wagon museum, Cultural museum, Private Library, Pub museum and the vintage motor museum, they will take you to a time that you aren’t familiar with, and make you comfortable there. Enjoy! Cathcart is replete with experiences which can be enjoyed with any of the Cathcart tours! Try the best Cathcart trip planner to visit this Thomas River Historical Village as well as many others. Find out how to reach Cathcart to begin with. Plenty of wholesome Cathcart vacation packages are available to choose from, pick your today! Love this? Explore the entire list of places to visit in Cathcart before you plan your trip. Fancy a good night's sleep after a tiring day? Check out where to stay in Cathcart and book an accommodation of your choice. Quaint little place with a basic restaurant. Many interesting collectables on display. Old world charm. If you're looking for a day outing this is nice. Historic village with car museum and other interesting old items. Restaurant, bar and small pool. Food like mom makes. Very tasty. Interesting decor. Outside seating and children's play area. Needs better air conditioning inside during summer. Had wonderful family birthday party there. Lovely food. Good venue and friendly staff. There is an extensive and continually growing collection of curated memorabilia from East London and the local area housed here - including a collection of items on Marjorie Courtenay-Latimer - famed for making known to the world the existence of the coelacanth, a living fossil fish - and Joan Harrison, the Olympic swimmer from East London. Jeff, the owner, is continually on the lookout for items at the East London city auctions and elsewhere. And the restaurant here is really good too.